Gatlinburg, TN, attracts thousands of visitors year-round who enjoy great food and friendly faces. The popular mountain town offers a quaint Tennessee charm that’s hard to find anywhere else. When visiting the Smoky Mountains, dining out is a must. So we rounded up the best restaurants, all of which offer lots of menu options and cozy atmospheres. We’re happy and proud to announce the picks for our new annual selection for the best Gatlinburg restaurants. Get Your Fill of Pancakes! Start the day off with a tall stack of pancakes and warm syrup. 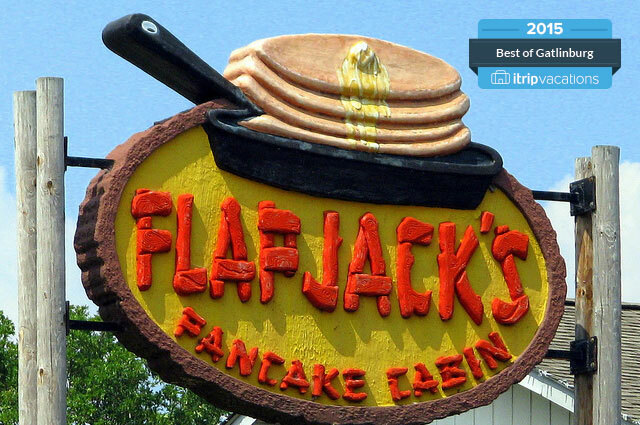 Flapjack’s, a favorite Gatlinburg restaurant since 2000, has seven locations in Tennessee. Specializing in country-style breakfast and brunch, the menu includes Elkmont egg platters, omelets, campfire skillets, and pancakes of course. Pancakes are stacked four high, and diners can top them with fruits, peanut butter, chocolate, nuts, whipped cream and more. Flapjack’s also serves a lunch menu with soups, salads, sandwiches and house specials. Reviewers advise arriving early because this local staple is usually packed. Top rated by TripAdvisor and customers, Alamo Steakhouse features Angus steaks grilled over an oak fire. Open for lunch and dinner, this restaurant offers a large menu for adults and kids. Lunch items include soups, salads, sandwiches and the famous Alamo steakburger. Burgers are ground fresh daily and made using their own grilled filets, ribeyes and New York strips, all served on a Ciabatta roll. Dinner options range from bourbon salmon to orange-brown sugar ribs. Even better, all entrees come with a salad and side. Customers praise the restaurant for hearty portions, so come hungry. 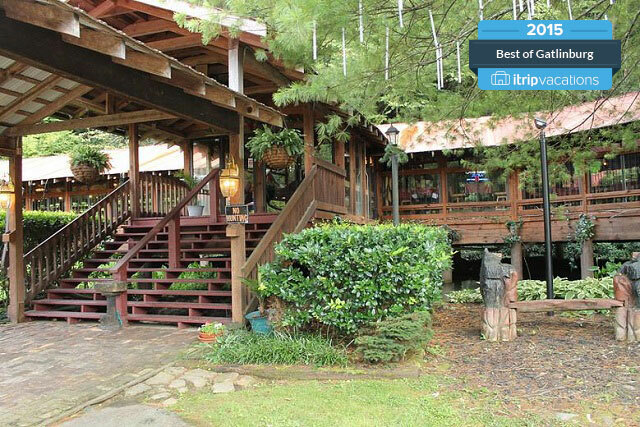 A top restaurant in Gatlinburg, Crystelle’s provides affordable, upscale mountain dining for all ages. Two dining areas give customers a different experience. The inside room has live entertainment, and the other is an enclosed sports porch. This restaurant is one of the few dog-friendly restaurants in Gatlinburg because customers are welcome to bring pups and dine on the porch. With a full dinner menu, Crystelle’s serves soups and salads, steaks, seafood, chicken, and Italian dishes. Signature items include skillet fried or blackened grilled trout, 8-ounce salmon filet, and catfish. Desserts are made daily, so ask the server what’s on the menu. Affordable Mexican food and a fun atmosphere make No Way Jose’s a popular restaurant in Gatlinburg. Grab a table surrounded by bright colors, and listen to music while kicking back with loved ones. With two locations in the area, the Gatlinburg restaurant overlooks the river and is directly across from Ripley’s Aquarium. Made from farm-fresh ingredients daily, salsas and sauces complement entrees including fajitas, enchiladas, combo dishes and a gluten-free menu. In addition, margaritas pair well with Mexican dishes, so try the Tijuana Cadillac or House of Blues, the house margarita turned tropical. What’s Your Pick For the Best Restaurant in Gatlinburg 2015? We want to hear from you! Did we miss a great restaurant or leave out your favorite spot? Let us know who we should consider for next year! Read what we picked for the 2015 Best of Gatlinburg Attractions. Need to list your vacation home? Check out our Gatlinburg property management services.